Gradient Flowers - Polish This! It's my birthday today, yay! :) So of course I had to do at least a bit special manicure to celebrate the day. Just couple days ago I saw this gorgeous manicure by Emilia from Dreaming About Nails and I just had to try those flowers myself. The original design is from Lacquerstyle.com and she has a great tutorial video in her post about the desing if you want to try it your self. My flower petals aren't really as neat as the ones I used as an inspiration for this manicure, but oh well, at least I tried once again some hand painting and since it's my birthday, I'm not going to be too hard on myself. 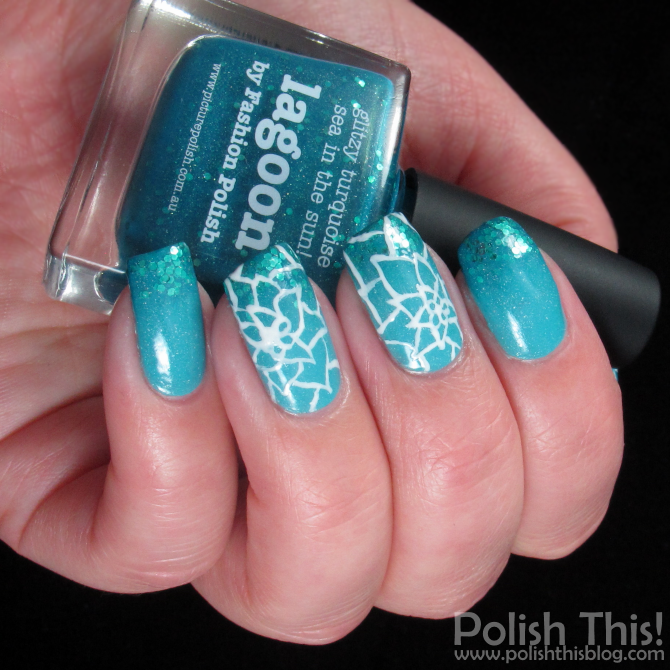 I did the gradient using two gorgeous Picture Polish lacquers: Cyan and Lagoon. 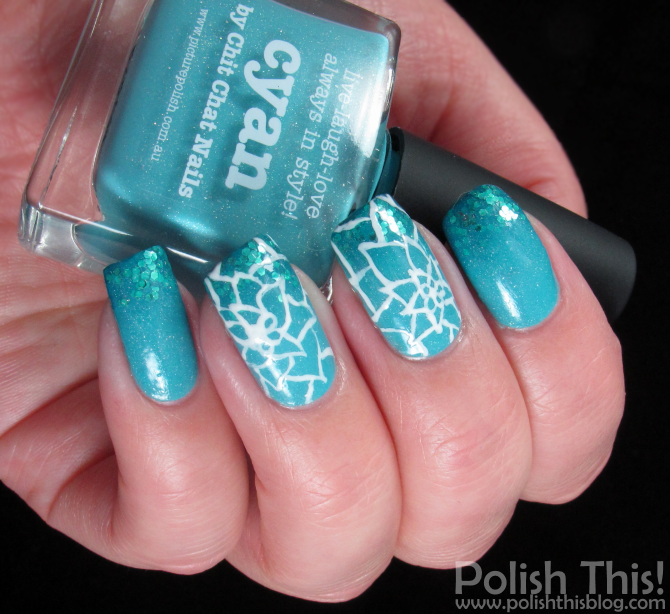 I first painted two coats with Cyan and then did the gradient with both of the polishes. This time I wanted only my tips to be darker, so I only used little bit of Lagoon. This turned out to be quite fun look as it looks like a combination between regular gradient and glitter gradient because of those glitters in Lagoon. For the flowers I used OPI Angel With a Leadfoot and a tiny nail art brush. I should have probably practiced these flowers just a bit before trying them on nail since the first one (middle finger nail) turned out a bit too edgy and the second one (ring finger nail) turned out a tad too wonky, lol. I still liked this look quite a bit and I think this was a perfect mani to celebrate my birthday. Nämä on nätit :) Tämä idea pitää pistää mieleen, jos joskus haasteissa tulee käsinmaalaus :D tai tuskin maltan odottaa edes siihen hetkeen, että kokeilen tätä. Ah mitkä värit ja mun on ehdottomasti hommattava joku kunnollisempi tai useampi pieni sivellin, mun ruusutkin meni ihan plörinäksi. Tosi hienosti onnistunut käsin maalaus ja gradient :) Niin ja myöhästyneet synttärionnittelut! Cake for everyone! Oooh those flowers are gorgeous, I think you copied them perfectly! The glitter at the end is subtle, but at the same time adds so much to the design!